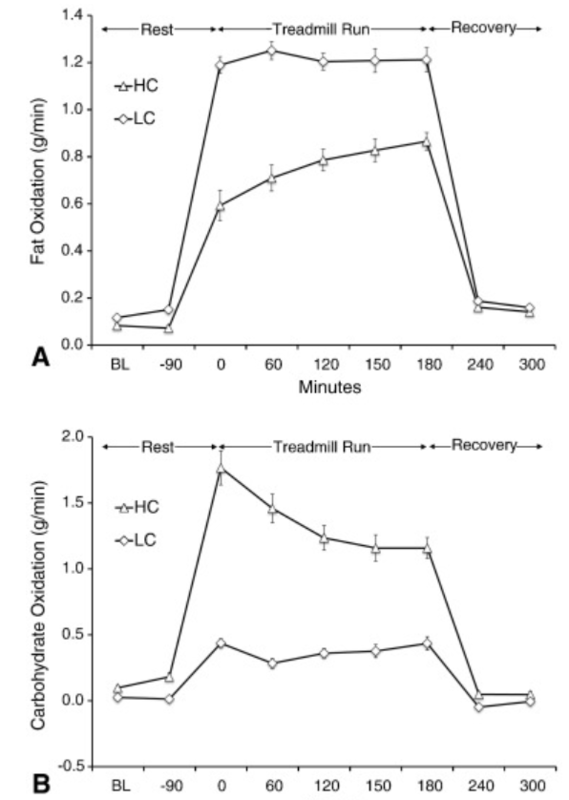 Overview: Twenty elite ultra-marathoners and ironman distance triathletes performed a maximal graded exercise test and a 180 min submaximal run at 64% VO2max on a treadmill to determine metabolic responses. 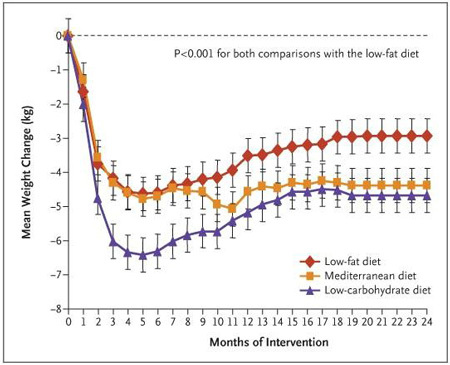 One group habitually consumed a traditional high-carbohydrate (HC: n = 10, %carbohydrate:protein:fat = 59:14:25) diet, and the other a low-carbohydrate (LC; n = 10, 10:19:70) diet for an average of 20 months (range 9 to 36 months). Results: Peak fat oxidation was 2.3-fold higher in the LC group (1.54 ± 0.18 vs 0.67 ± 0.14 g/min; P = 0.000) and it occurred at a higher percentage of VO2max (70.3 ± 6.3 vs 54.9 ± 7.8%; P = 0.000). 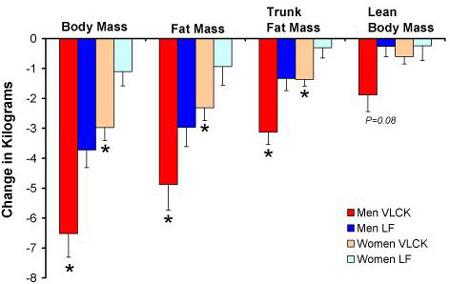 Mean fat oxidation during submaximal exercise was 59% higher in the LC group (1.21 ± 0.02 vs 0.76 ± 0.11 g/min; P = 0.000) corresponding to a greater relative contribution of fat (88 ± 2 vs 56 ± 8%; P = 0.000). Despite these marked differences in fuel use between LC and HC athletes, there were no significant differences in resting muscle glycogen and the level of depletion after 180 min of running (− 64% from pre-exercise) and 120 min of recovery (− 36% from pre-exercise). Conclusion: Compared to highly trained ultra-endurance athletes consuming an HC diet, long-term keto-adaptation results in extraordinarily high rates of fat oxidation, whereas muscle glycogen utilization and repletion patterns during and after a 3 hour run are similar. Read more at Diabetic Medicine by way of Kris Gunnars, Authority Nutrition. New England Journal of Medicine by way of Kris Gunnars, Authority Nutrition. Read more at Lipids by way of Kris Gunnars, Authority Nutrition. Read more at Nutrition and Metabolism by way of Kris Gunnars, Authority Nutrition. Read more at The Journal of Clinical Endocrinology and Medicine by way of Kris Gunnars, Authority Nutrition. Read more at the New England Journal of Medicine by way of Kris Gunnars, Authority Nutrition.